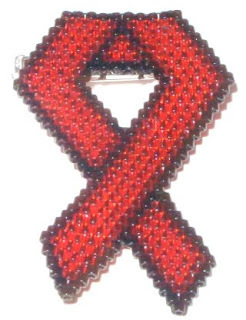 Everyone in my family wears a red ribbon. Mike and the teens wear the stick on kinds and have them on all the jackets they wear with any regularity. It's the only accessory type thing Mike wears on a regular basis. No bracelets, necklaces, rings or pins. Just that awareness ribbon on the jackets he wears. Mike and I have friends with AIDS and we've both lost friends to it. I wear lots of jackets or no jacket at all and decided to bead myself one that I could move from jacket to jacket or pin on my purse. I'm not saying it's the only cause we support, but it's the one we wear ribbons for. I know other people wear other colors of ribbons. This is the pattern for the ribbon. 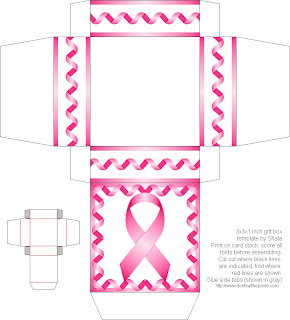 Make it in the color you want, and if you want to make them for sale to raise money for your cause, by all means do. I did mine in brick stitch. 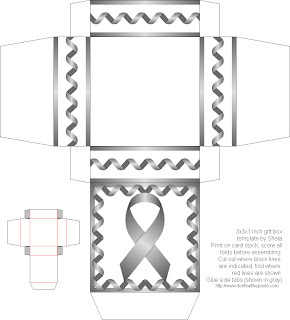 Since I knew I wanted to post this pattern, I also made up some boxes that you can package items you sell to raise money/awareness. There are so many ribbon colors to choose from, I chose red for AIDS awareness, yellow for the troops and pink for breast cancer. There is also a greyscale box that you can re-color in a graphics program. If you don't know how to do that and really want a specific color, just let me know.